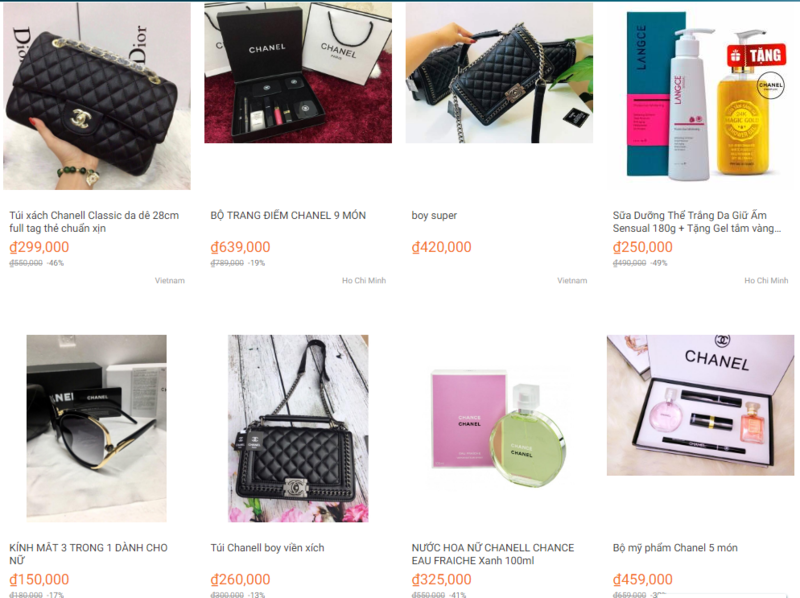 A Chanel purse is sold for only VND200,000 (US$8.8) on Lazada. Those items purportedly of renowned brands that are on sale on popular e-commerce websites in Vietnam at unusually low prices could be counterfeit or contraband products, as relevant manufacturers confirm they have never make such cheapies. Online marketplaces, a type of e-commerce site where product or service information is provided by multiple third parties, are growing increasingly popular among Vietnamese consumers. However, some of the most popular platforms, such as Lazada, Sendo and Shopee, have emerged as a favorite place for sellers of fake, copycat and even smuggled products to seek buyers. As these e-commerce companies only function as intermediaries for businesses and customers, disputes are common when it comes to who will be held responsible for dishonest business activities. An electric egg beater under the brand Philips is sold for VND150,000 (US$6.6) and VND110,000 ($4.84) on Sendo and Lazada, respectively, both with a three-month warranty. However, a Philips representativetold Tuoi Tre (Youth) newspaper that the Dutch brand only supplies two models of electric egg beater at VND790,000 ($34.76) and VND1,090,000 ($47.96) with two years of warranty in Vietnam. The representative believed that the rock bottom-priced devices available on Sendo and Lazada might be fake or smuggled products. Likewise, a ‘Panasonic HC 3100 hair dryer’ is being listed on several e-commerce platforms in Vietnam at around VND84,000-99,000 ($3.7-4.4) per item, while the Japanese electronics manufacturer denies having such a cheap device in its product line. An electric indoor grill stove is also on sale on several online shopping websites, with the vendors claiming that the product is made by Samsung in South Korea, while the electronics giant has never manufactured this kitchen equipment. Bogus products disguised as world-class footwear and fashion brands such as Adidas and Chanel are easily spotted on these online markets at prices as low as VND200,000 ($8.8) apiece. Adidas shoes for VND300,000, anyone? L.M.P, a resident in the Mekong Delta province of Tien Giang, shared with Tuoi Tre his experience of purchasing a smartphone from a seller on Sendo, an e-commerce platform run by local tech giant FPT Group. P. paid VND1.99 million ($87.5) for what he believed to be an Oppo F1S smartphone with a 32GB storage, believing it was a good deal thanks to a 17-percent discount offered by Sendo. But after unboxing the gadget, P. could not use it as the phone’s screen kept flickering, and the storage was full even when he downloaded only one app. The customer checked the device’s IMEI, a unique 15-digit number used to identify mobile devices, on the official website of the Chinese smartphone maker and found no result, meaning his handheld was inauthentic. P. immediately complained to Sendo about the problem, but he heard nothing from the Vietnamese e-business until one month later. What made P. most disappointed is that Sendo passed the buck to the seller, who declared its product as authentic. Tuoi Tre reporters also came to the warehouse of a supplier on Lazada to ask to buy the Bluetooth USB drive in bulk. A male employee of the supplier made no secret of its low-cost products being imported from China, and it was ready to supply upon any request. However, the seller refused to provide any documents of origin and receipt. Similarly, an IP Wi-Fi camera seller, which is based in Hanoi and lists its products on multiple e-commerce platforms, refused to present invoices for the products when approached by Tuoi Tre reporters. Answering Tuoi Tre, a representative of Shopee affirmed that all of its sellers were required to strictly follow the firm’s regulations on ensuring products’ origin and quality. However, the sellers have to take their own responsibility for any violations, according to the representative. A representative of Lazada also asserted that it requires sellers to provide invoices for customers at the latter’s request. However, the e-commerce company does not have any measure in place to check if its partners really abide by the rule.